Due to its wide variety of magnification ranges, reticles, and scope finishes; Nikon’s ProStaff 5 Series has a scope for almost any hunting application. ProStaff 5 riflescopes utilize an optical system that uses fully multicoated optical glass that allows for up to 95% light transmission. 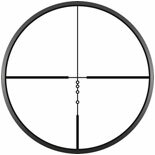 Select riflescopes in the series have a silver finish or first focal plane reticle. All long range models, (3.5-14x and 4.5-18x) feature Side Parallax Adjustment that allows for adjustments to be made without changing your shooting position. ProStaff 5 riflescopes are compatible with Nikon’s SpotOn Custom Turrets giving you the ultimate advantage in the field.